"Real Talk Real Deals" wants to invite you to be a part of our "Global Economic Development Network". Join us and let's share eachothers vision for a brighter future. Let's all perfect the science of growing money, consolidate our resources, exchange ideas, co-create progress and pave the way for a much more "Prosperous, Sustainable, Cleaner and Greener Future Beneficial to All!" Feel free to Invite your Strategic Partners, Business Associates, Land Developers, City Planners, Marketing Directors, Engineers, Investors and Bankers along with your entire Linkedin and FaceBook Family and Friends to be a part of our new "Economic Development Initiative". It's time to make some real noise and share ideas on how we can all help eachother deliver the goods on co-creating New Jobs, a Healthy Economy, New Enterprise and New Award Winning Mixed Use Land Developments. Be a part of our new movement and "Help Promote Green Living and Renewable Energy Plans". 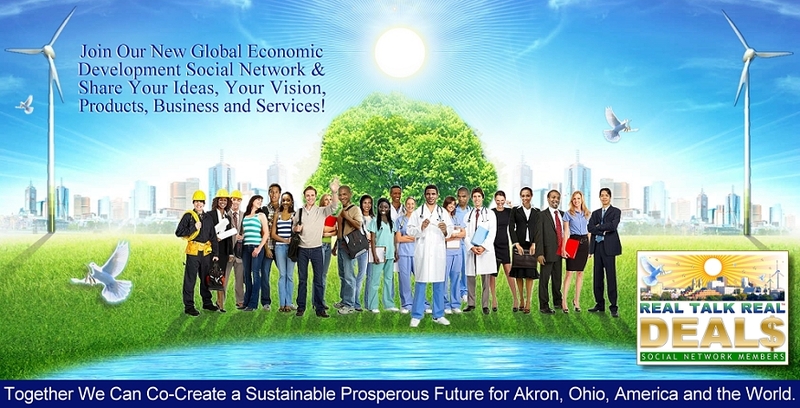 Let's all "Network, Live and Play Together" while building a Healthy Local, National & Global Economy. Join "Real Talk, Real Deals" Social Network Today & Shine Your Corporate Light!